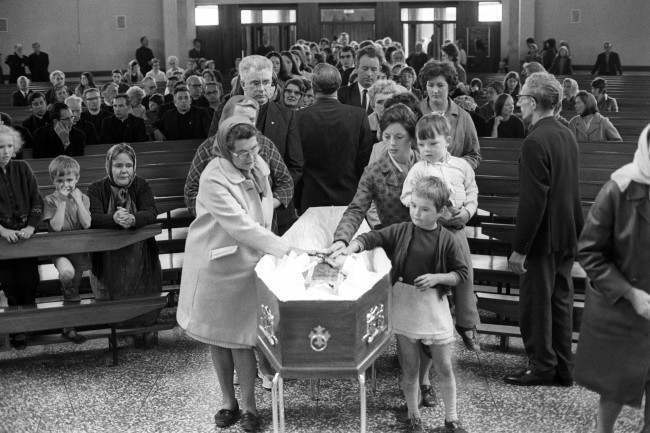 need some information on whether St john's near the bottom of the Whiterock road was ever bombed around 1971, family argument need help thanks in advance. You're talking about Saint John's Roman Catholic Parish Church on the Falls Road, directly opposite Belfast City Cemetery. 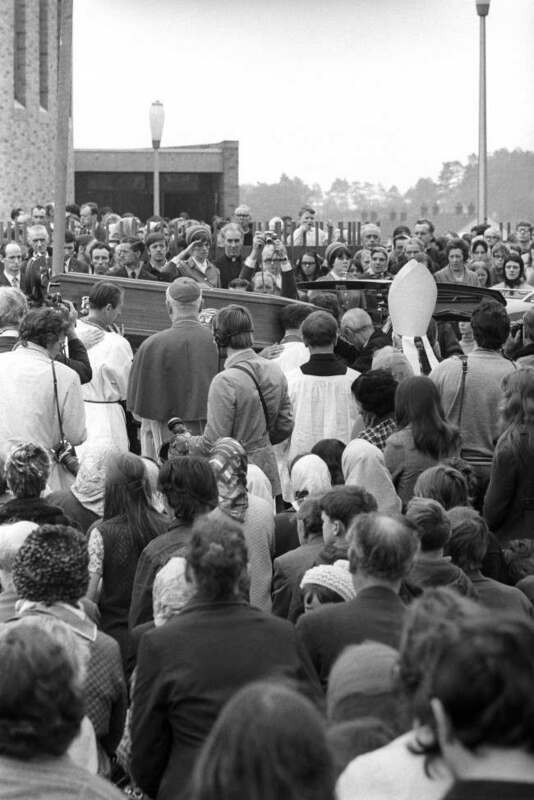 Monday 9th August 1971, Reverend Father Hugh Mullan was the first Catholic priest to be killed in the conflict when he was shot dead by the British Army as he was giving the last rites to a wounded man. His age is given variously as being either 37, 38, or 40. People of Ballymurphy estate pay their respects to Reverend Father Hugh Mullan as his coffin leaves Corpus Christi Roman Catholic Church after Requiem Mass. Father Hugh, was killed during Monday night’s bloodbath in Belfast, which occurred after the announcement of internment of terrorists, after attempting to give last rites to a wounded parishioner. 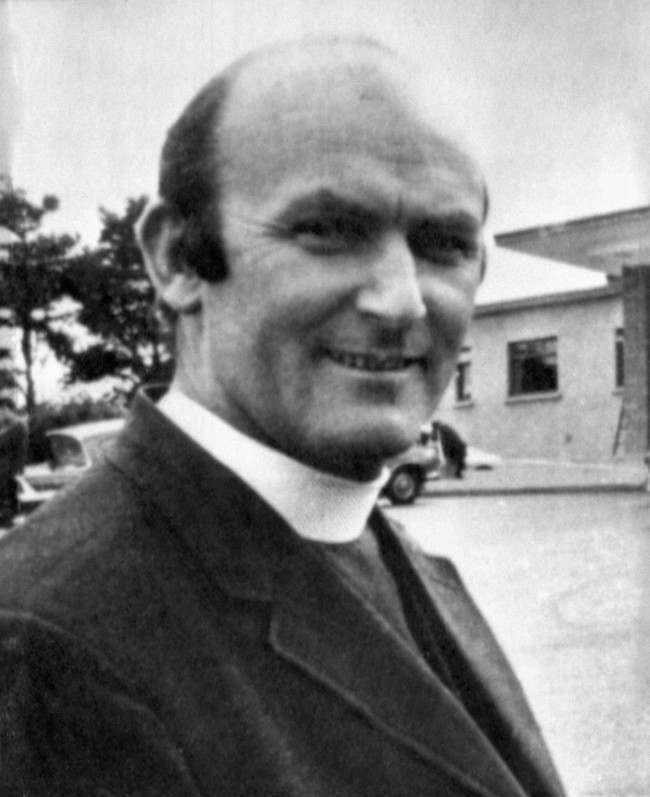 He was curate of St John’s in Falls Road and he will be buried in his home town of Portaferry in County Down, Northern Ireland. Mourners file past the coffin of Father Hugh Mullan, at Corpus Christi Roman Catholic Church on the Ballymurphy estate after Requiem Mass. 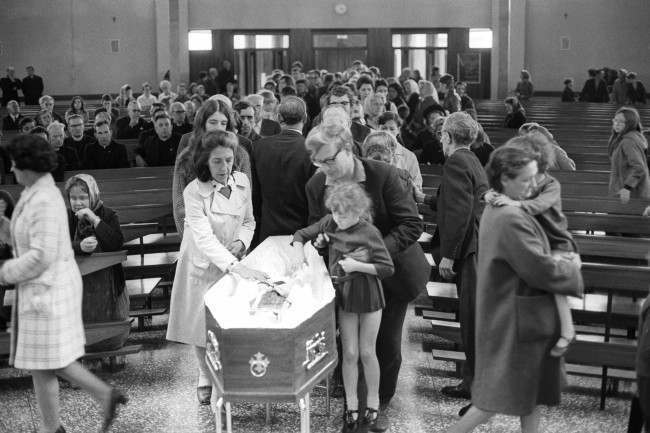 On the 9th of July 1972, Father Noel Fitzpatrick, aged 42, and also of Saint John's Parish Church Falls Road, but based in Corpus Christi Church Springhill, was shot and killed in Springhill Avenue, in similar circumstances. They are both commemorated on the Ballymurphy Memorial, Divismore Way, Ballymurphy. There are definitely a few posters on BF who lived and / or worked in and around the parish at that time. You should be able to get a pretty authoritative answer from them. I do not recall any bomb specifically aimed at the church although there may well have been bombs close by. There may also have been an attempt which was defused but I don't know for sure - others might. Absolutely correct, BMG. 'A Man for All Seasons'. One who always knew that the message was about action and not just sermonising. Also, in times of great stress, sidelining by Church authorities and perhaps [who knows] personal doubt Desie Wilson never wavered in keeping faith with, and being respected by, the people. Re St Johns :The only incident I recall was a lady who was tarred and feathered at the railings surrounding the front of the chapel.The comments about Fr Wilson are spot on, a decent man who was treated shamefully by the Canon. I was an Altar boy in St Johns, knew Fr Wilson , think the Parish Priest when he came to the parish was Fr McAlea, others that come to mind were Fr Maginn, McCall, Leonard. The Sacristan was an oul boy from up the Rock, Christy Convery, Fr McQuillan had the house beside the chapel,his house keeper was Nan Hegarty from Draperstown, he famously used to buy all the Sunday editions of The News of the World from the paper seller, Micky Vernon, at the corner of Hugo Street. The other priests lived in a large house at the back and to the side of St Kevin's with a road down from the Falls.The Ferguson brothers, Michael and Hugh were on the same Altar boy team and came from up the Rock. Hi BMG, Fr McCall lived in one half of the house that was/is the Rossa, up past the Billboard Inn at the bend on the Falls just before the park. Frequently served mass in record times, gave out communion like he was dealing cards, had his own cruets for wine and water that where at least three times the size of the others, smoked Gallaghers Blues and would send to Sheehans for a bap .